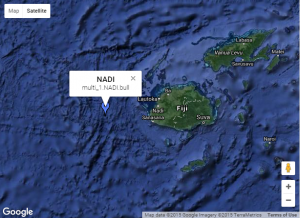 We just added a forecast point for Nadi, Fiji in time for the WSL contest! Looking at the new buoy map we can see the model output point is very close to Cloudbreak and should give us an interesting look at the swell that makes Cloudbreak go off. Currently we have heavy SE trade swell with a small SW ground swell. Cloudbreak is sheltered from short period SE swell but the wind associated with the waves will be a factor. Trade swell will gradually come down as SW ground swell builds to about 3.5′ at 17 seconds Friday (Fiji time). Steady ground swell will hold through Sunday, then build to 6+ feet Monday and Tuesday. Should be a good finish! See the forecast for Fiji here. For a description of Fiji’s surf breaks and lots of dreamy pictures check out this Storm Surfers pdf available online.